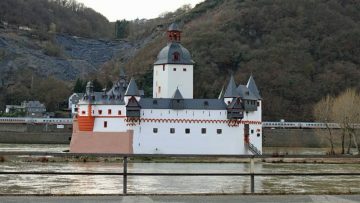 Day trips and boat pleasure cruises on the Rhine River (Rhein) and Loreley Valley are easy from Frankfurt am Main Hauptbahnhof and Airport (FRA) in Germany. Regular day pleasure boat cruises on the Rhine River (Rhein) rarely depart from Frankfurt am Main itself but are easily arranged. Fast trains from the Hauptbahnhof and Frankfurt International Airport (FRA) allow even passengers with a few hour stopovers to enjoy cruising Germany’s most famous river and see popular sights including castles and the Loreley Rock. It is a short train ride from Frankfurt’s main station or directly from the airport to Rhine towns including Rüdesheim, Bingen, and Koblenz which are ideal departure ports for Rhine river valley day pleasure cruises. 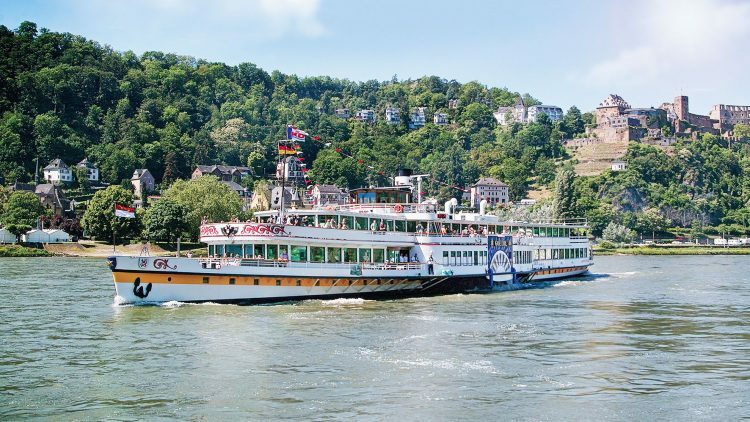 Although day pleasure cruise boats depart from many cities and towns between Mainz and Cologne, the most popular part of the Rhine River for day cruises are the Loreley Valley with boats departing from Rüdesheim or Bingen to St Goar and St Goarhausen. This part of the Rhine River valley is inscribed on the UNESCO World Cultural Heritage list. Here the valley is the steepest and narrowest, often covered by vineyards, and sporting a castle or castle-ruin every two kilometers or so. Rüdesheim is one of the best departure ports for pleasure cruises on the Rhine. Rüdesheim see many departures by numerous cruise lines including the largest (KD Köln-Düsseldorfer) and many smaller (and sometimes slightly cheaper) boat operators. Rüdesheim also have excellent train connections to Frankfurt. See also Day Trip Rhine and Main River Cruise Boats from Frankfurt for pleasure boat excursions on the Main and Rhine, although the train to Rüdesheim is generally a better idea than the boat to see the best parts of the Rhine. Frankfurt am Main is Germany’s transportation hub. Not only is Frankfurt International Airport by far the busiest in Germany but the Hauptbahnhof is also the most important railway hub in Germany. Numerous routings are available from Frankfurt to the Rhine Valley but it is best to stick to direct trains – missed connections, and German regional trains unfortunately do not always run like clockwork, can mean long delays in boring stations. Regional Express (RE) trains run from Frankfurt Main Station on either side of the Rhine and again meet up at Koblenz at the confluence of the Mosel and the Rhine. Trains on the right bank run mostly once per hour while the faster trains on the left bank run every two hours. Passengers from Frankfurt International Airport can save time by taking the S-Bahn train S9 to Wiesbaden and change there or at Mainz-Kastell to the RE trains rather than going to Frankfurt Hauptbahnhof first. From the airport to Rüdesheim takes around 90 minutes. The trains on the right bank of the Rhine are operated by VIAS and may have VIA in the train name. However, for most travelers the difference with regular DB German Railways trains are hard to spot and the same tickets and deals are accepted. Trains from Frankfurt am Main to the left bank of the Rhine River are less frequent but somewhat faster than on the right bank. Further slower Regional Bahn (RB) trains operate on the left bank but generally start from Mainz. S-Bahn trains S8 offer further connections from Frankfurt Hauptbahnhof and International Airport to Mainz. RB trains also stop in popular tourist towns including Bacharach, St Goar, and Boppard. Note that the fastest trains between Koblenz and Frankfurt usually stop only in Mainz and at Frankfurt International Airport and not in the smaller Rhine villages. See also Loreley Valley Rhine River Day Cruises for more information on the variety of Rhine day cruises available on the Middle Rhine and Top Rhine River Day Trip Cruise Lines for a selection of the top day pleasure cruise lines operating in the Loreley Valley. Regional Express, Regional Bahn, and S-Bahn trains running along the Main and Rhine are local trains for which Deutsche Bahn has several special discount tickets.